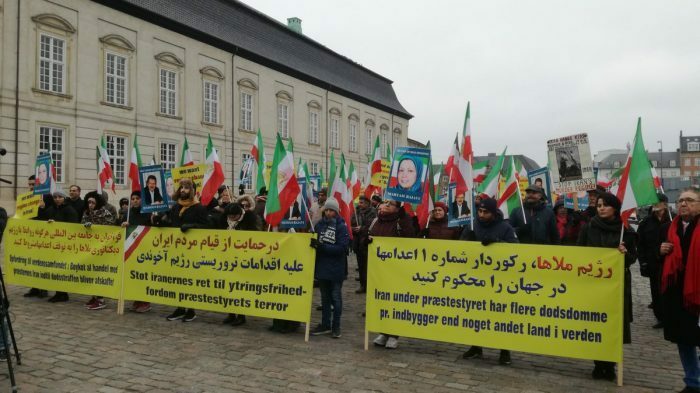 Demonstrators gather in Copenhagen to protest EU’s inaction in the face of the Iranian regime’s terrorist attempts in Europe. 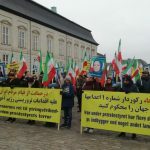 On Friday, November 23rd, members of the Iranian diaspora, supporters of the Iranian resistance and allies and sympathizers to the People’s Mujahedin Organisation of Iran (MEK) gathered in Copenhagen to call for a stern response to Iranian aggression. The protest was prompted after 2018 saw a surge in Iranian aggression across Europe. In early 2018, during the Persian New Year celebrations, Albanian authorities foiled a plot to attack the MEK members living in exile. Then, in late June, another plot was foiled. An Iranian diplomat working at the Iranian embassy in Austria provided a Belgian-Iranian couple with an explosive device, along with detailed instructions of where to detonate the car bomb. Its target was the MEK’s annual Grand Gathering event, where more than 100,000 supporters of the Iranian opposition had gathered in Paris. Following an investigation by French authorities and the MEK, it was concluded that senior members of the regime leadership had been personally involved in the planning and execution of the foiled Paris attack. The regime’s nefarious and dangerous plots were not restricted to European soil. Shortly after the unraveling of the Paris attack, the United States government detained two regime agents on espionage charges. The men had been gathering intelligence against the MEK in the US. It is likely that the pair were involved in reconnaissance work ahead of a planned terror attack on the MEK. At the protest in Denmark, protestors braved the Scandinavian cold and held placards reading, “we want regime change in Iran!” Others carried images of the MEK’s leader, president-elect Maryam Rajavi. The protests mirrored many of those seen across Iran in recent months. The most recent of which has seen the workers at Haft Tappeh sugarcane factory go on strike and call for the toppling of Rouhani and Khamenei’s evil regime. The protestors also urged the EU and Western governments to coordinate a coherent and united response to Iranian terrorism. The protestors called on the EU to include the Iranian regime in its terrorist blacklist. This sentiment has been echoed by many prominent European politicians in recent weeks. On Monday, 150 members of the European Parliament (MEPs) signed a document calling for the expulsion of regime intelligence agents from embassies on European soil. Former Italian Foreign Minister, Giulio Terzi, has also publicly advocated a policy of maximum pressure on the Iranian regime. Among the pleas of the protestors in Copenhagen was the need for all those accused of state-sponsored terrorism to face trial in Europe. Assadollah Assadi, the regime diplomat who orchestrated the Paris plot, was extradited to Belgium to face trial. However, his defense lawyers argued the move was illegal. They suggested that his diplomatic status, granted to him under the Vienna Convention on Diplomatic Relations, meant he could not stand trial for his crimes. The people of Europe evidently understand the need for a coordinated and firm response. Without it, it is their lives the European heads of state are putting at risk. Should the Iranian regime succeed in executing a terror attack in the heart of Europe, the casualties will be numerous, with many European citizens caught up in the collateral damage of the regime’s war with the MEK.